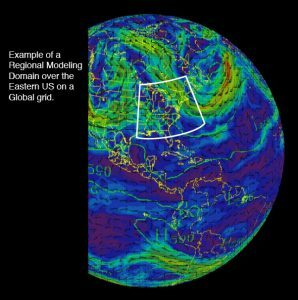 General Circulation Models or global climate models (GCMs) are essential tools for climate studies. While simpler models have also been used to provide globally- or regionally-averaged estimates of the climate response, only GCMs, possibly in conjunction with nested regional models, have the potential to provide geographically and physically consistent estimates of regional climate change which are required in impact analysis. 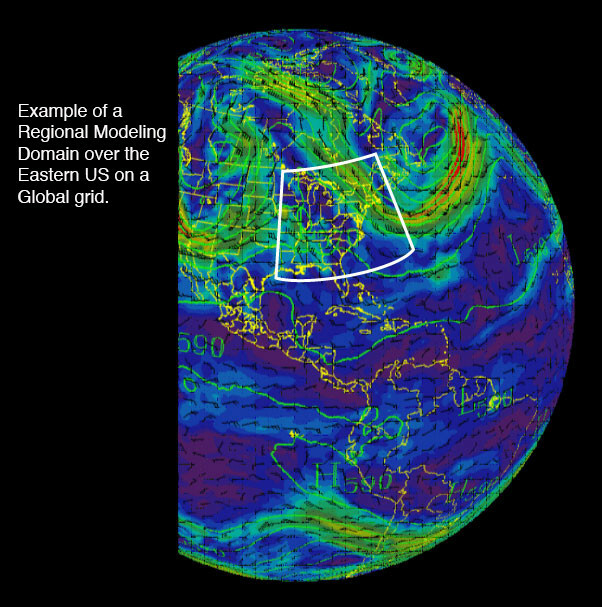 ome GCMs focus on modeling the atmosphere (AGCMs) while others model the ocean (OGCMs). More advanced versions couple the atmosphere and ocean (AOGCMs), but become increasingly complex. Typically GCMs have as a resolution of 200 km to 300 km. This means that the Earth’s surface is divided into grid cells that are 200 km to 300 km along each side. GCMs need to solve a set of fundamental equations in order to obtain values for the wind, temperature, moisture and pressure at each location in the Earth’s atmosphere. A few years ago, GCMs only included a representation of the atmosphere, the land surface, sometimes the ocean circulation, and a very simplified version of the sea ice. Nowadays, GCMs take more and more components into account, and many new models now also include sophisticated models of the sea ice, the carbon cycle, ice sheet dynamics and even atmospheric chemistry and are based on various emission scenarios.